The Fifth-size Book Adventure is a professional development programme for artists in the North East managed by Jane Shaw of People Into Enterprise, working with the Library Service in Newcastle and supported by Arts Council England. The aims of the programme are to look at ways artists can commercialise their work towards long-term sustainability in their practice; to look at ways the Library Service can exploit their assets to broaden their cultural opportunities; and to create a body of new works inspired by the collection of ‘fifth-sized’ books in Newcastle City Library. This is my adventure and I’m sharing it. Press days. They always seem like a great idea when you agree to them. They’re frequently a great idea afterwards too. The reality of them are that they can be the most stressful bit of any project. If you think private views are a bit of a hectic deadline – there’s always wet paint on the opening night somewhere – press days are often before then. A sort of not-quite finished time when you’ve got to sow the illusion that everything is how it will be on the opening night even when it clearly isn’t. And just when you think the artwork you’ve been slaving over for months is the star of the show, they always seem to want an unhealthy amount of images of you as the artist instead. Of course, that’s what it feels like but in many respects it’s an absolute necessity. I’m quite sure if I didn’t get any press for my projects then I wouldn’t be where I am. Media presence has three main benefits. Firstly it gets the word out about what I’ve done. Mass media – newspapers, radio and TV are very powerful conduits. They reach vast numbers of people. Local newspapers are particularly useful for getting people locally to know what’s happening on their doorstep. Local papers tend to be widely read in any area and reach a wider demographic than national newspapers often. As well as local papers where I’m working, I keep a good relationship with my own local paper where I live. It’s really good for building up a profile locally which is always good for letting my neighbours know what I do. Local press and local radio are the main drivers for getting people out to see what I do I find. 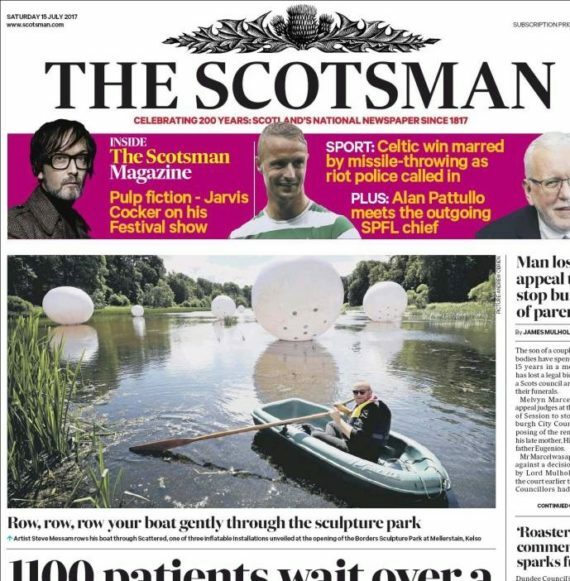 There’s nothing elitist about local press so it becomes a great leveller and brings people out who might not normally be interested in contemporary art. Secondly, media coverage builds profile. Most of the people who see or read about my work in newspapers or on the local news don’t actually see my work in real life, but over time some get to know what I do and build up a picture of my practise. It still amazes me (somewhat naively) that people I’ve never met seem to know what I do. Only the other week in the library a woman came in to see me somewhat starstruck. Her daughter’s class at primary school had done a whole project on my work and done some of their own outdoor pieces and she couldn’t believe I was actually in her library! OK, so things like that weird me out a bit. I had no idea that kind of thing goes on or why the school should be studying me of all people, but I took the compliment. Profile is good. It’s what gets me work. Social media helps with it too. I’ve had a number of sizeable commissions as a direct result of being on Twitter. Interesting to note I’ve not had anything off Facebook yet, but that’s either down to me not spending much time with it, or their seemingly random feed algorithms. Finally, media profile has value. With all media coverage, it’s not just me benefitting. It’s equally, or sometimes more so, doing exactly the same for my client – the event, or the organisation commissioning me in the first place. Sometimes the media coverage alone is the end product for some commercial clients. Editorial coverage in publications is far more effective at raising the profile of an organisation than placing an advert. In PR terms there is a real monetary value to this. You can take the column inches of any press or seconds of airtime in broadcast media, and determine a value based on how much it would cost for an equivalent sized advert. This is known as Advertising Equivalent Value (AEV) and for the hard nosed bean counters who let you loose with their money is currency and a return on investment. Back in 2015 I built ‘PaperBridge’ for Cumbria Tourism as part of a wider scheme to engage art with tourism across the UK. We had no marketing budget for it specifically and in fact only one A4 poster ever got put up anywhere for it. Its success was entirely through local media contacts, which in turn got picked up nationally, then internationally as the piece went viral. Within a month images of the piece alone clocked up an AEV for Cumbria Tourism, and James Cropper, the paper manufacturer, in excess of £200,000. It hasn’t stopped since then and conservatively it’s now worth a good half a million. On top of this, the project led directly to me building an even bigger one in China for LandRover. As projects go, it certainly wasn’t a cheap thing to do, but the client knew the cost of a 90 second advert on YouTube and given the international press coverage it got along with online views, as far as they were concerned it was great value for money. For me, I got to build one of the most beautiful bits of paper architecture and submerge myself in creating an artwork for a few months. 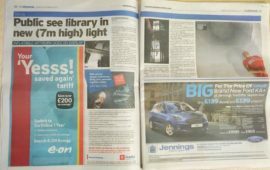 So, a meeting was had and the City Council press officer thought my residency at the library might make a good story for the local press and was I interested? Part of my mini residency in the library was to explore to potential of the library and artists for mutual benefit. In this respect it would be great to show how the library was engaging with an artist in a new way. It’s another layer to the narrative of what the library does beyond lending books. So I worked closely with the council press team to create a photo opportunity to sell the story. It was also important that the story put out in the press release was more than just me making big things in the building and led into the wider ‘Big Books’ project. As always, the photo shoot was up to the wire with still sewing in zips when the photographers arrived. But still, we managed to inflate an 8 metre high form in the front of the building and lit it up so it could be seen down the length of New Bridge Street. 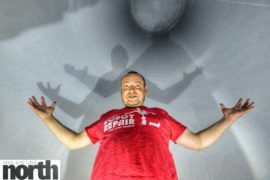 At three metres in diameter, the piece was large enough to stand inside and the photographers took no time in getting some photos of me inside the piece. The obligatory artist portrait shot. It was always going to be a picture-led story, so thankfully both photographers went away with a bunch of strong images. The Journal featured it on page three of the Monday’s paper with mostly the press release as the story. For the Chronicle article, the extra lead time for them enabled a writer to be assigned and their story ran over two pages. 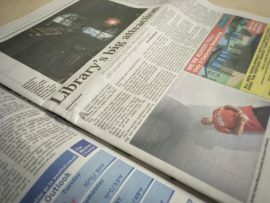 While the story itself may not be that ground breaking or newsworthy on its own, it still added editorial interest to the publications and helped show the library in a different light to a local audience. The press release also gave an opportunity for Arts CouncilEngland to highlight the role they have with libraries, and in doing so created a new line of communication between the project and its major funder. My project here continues to take shape. I now have a direction for the rest of the images and today I’ve started thinking ahead to not only the full content of the final book, but also page dimensions, paper stock, printing method and binding. So much more to do. A couple of years ago I undertook a period of professional development myself. It’s always good to stop and look at what you’re doing and think about where you want to go next. It was a very valuable experience and as part of that I got some mentoring time from some of the most experienced professionals in the field of large scale installations. One of the biggest things I learnt from them was the importance of testing everything at full scale before the install. I kind of knew that but it was good to hear it from people who have been doing this far longer than me. Since then I’ve tried to ensure that full-sized testing is part of the process of creating new works. The PaperBridges I built a couple of years ago, were the product of years of building prototypes at ever increasing scales and creating the necessary angles in sections of full sized sheets. I built a paper bridge in China for a 3.5 tonne RangeRover to drive over, but long before it was built, we drove the exact same model of car over life-sized plywood arcs to check the clearances and how it looked for proportions. Last year’s ‘Waterfall’ protection installation was tested life-sized in a warehouse first before a whole night’s test projection on site to iron out all the technical problems with working in remote fields. None of that happened in the library last week. Against everything I’ve been working towards for years, last week’s mini-residency in the City Library was a whole different beast. 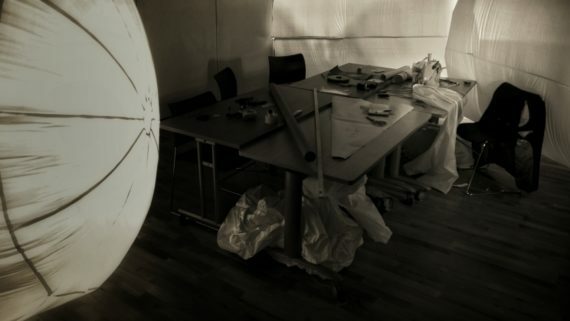 Part of the challenge of the residency was to produce a body of work on site in just four days. Part of my brain was saying “that’s crazy! You can’t do it.”, while the other side was secretly liking the challenge and the risk. Risk is good – it’s what keeps life exciting. I wasn’t completely unprepared. Obviously I’d done a life-sized test already in the library, so I knew how the pieces needed to behave. I’ve also done a number of inflatable installations in various locations over the past year, so I had a pretty good idea how to construct them. I’d done a couple of recce’s around the building so I knew which areas I wanted to work in. I had plans of all the floors in the building and had read vast amounts about the construction and history of the architecture. At least I’d done my homework. However, on the day I was still faced with the reality of designing, fabricating, installing and photographing a new construction every day for the week. Regardless of the homework, that’s still a daunting task. The sensible thing would have been to build the inflatable forms in my studio first. But part of the reason for the residency was to be transparent about the process, so I felt it was important to show the whole process for anyone that wanted to see it. Each day I knew where I wanted to photograph in the evening, but no more than that. So each day started with revisiting the location, measuring up the negative spaces I wanted to fill, checking the angles of view for the images and locating where the power points were for the lights and fan. 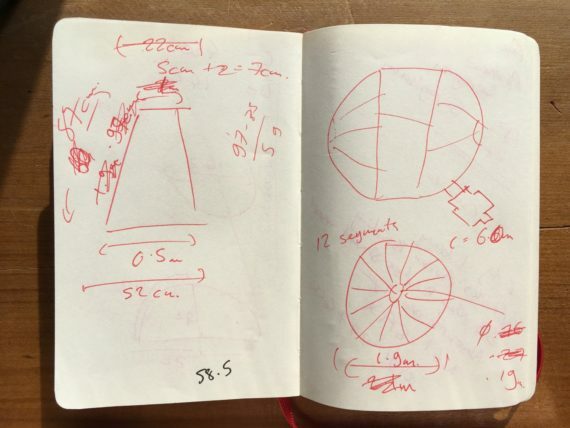 I then sketched out the form in my notebook and calculated the dimensions and construction method. Patterns for the end sections were drawn onto large sheets of paper and plotted onto the fabric for cutting out. Sewing the panels, while one of the easier tasks, was by far the longest part of the process. 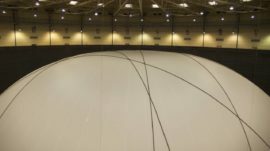 On the final day, the 7.5m long straight panels was a time and motion event in itself. Each seam took 20 minutes of sewing time – that’s just how long it physically takes to feed it through the sewing machine. There were five panels in the main body making 1hr 40 mins of sewing time. Each end had a circumference of around 7.5m too, so another 40 mins of sewing for those. Each end panel was made from 13 smaller panels which took around 1hour of sewing. Already we’re up to nearly 4.5 hours of sewing. Thats before the zips and sleeve for the blower fan. Add on to that the time it takes between each sewn panel to find the next piece, line it up, wind new bobbins, and generally battle with the sheer volume of fabric and even these simple constructions take the best part of the day to just sew together. Despite having already done a full test for the first nights shoot, we still had a number of issues with it. The battery powered LED lights turned out to be more hassle than the original mains powered lights. The colour temperature of them was also far colder, to the point that it became impossible to compensate for it in post production with the fill lights I used were significantly warmer. 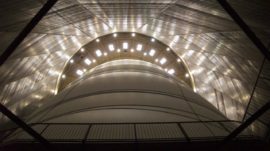 An additional and unexpected problem with security and emergency lighting levels became another challenge to the vision. The revised shape to the ends became far more pointed once inflated than I had anticipated and I wasn’t entirely convinced they worked with the architecture the way I wanted. The light and shape issues also compounded to the photo shoots taking far longer than expected and a late night for everyone. Still, the benefit of making pieces from scratch each day meant that I could take on board those issues from the first night and make adjustments to the subsequent pieces. The inflatable built on the second day worked much better overall. We also decided to ditch the idea of trying to do two locations each evening and instead concentrate on getting a couple of different shots from the same location. At the start there was every intention to create a body of images in a week. The time restraint and the pace of work required to achieve that was very much part of the project. But as I got into the project, it’s taken on a life of its own – my thoughts and approach to the project have evolved. As I start to contemplate the images as content for the final publication the more I want to expand the series and up the production values. 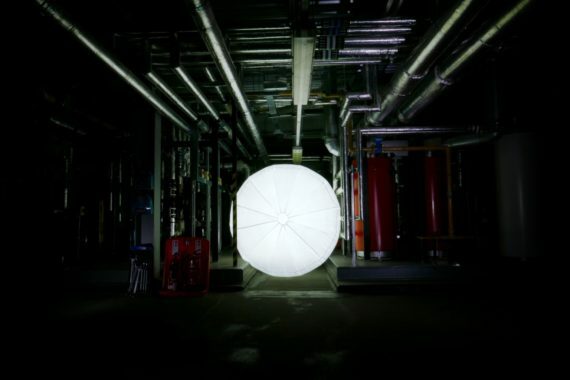 Next steps are revising the first inflatable and reshooting the first night’s images. This will probably extend to a number of new locations within the library building and maybe a final new inflatable for a couple of them. I can guarantee in every interview I do for press or radio or TV or in every talk I do for any audience, someone is going to ask “where did the idea come from?”. It’s a fair enough question. Most people see art as an end product arrived at but some crazy magic. I usually give them a short answer about a particular piece, but in reality the answer is never a short one or a simple one. The thought process part of any project is probably the biggest and most important bit. Long before pencil hits the paper or words go down on a page, there’s days, weeks or months even of thinking through the ideas. Mulling them over. Refining them. Interrogating them. Pulling them apart and then slowly putting them back together again. The thought process for this project started last year when I was first approached about the idea. Once we’d got round to the idea that I’d actually be able to create a new work from this opportunity (it’s something I always try to do – and part of the process of this project is showing how new work doesn’t always start off as a new work commission) I then had to start thinking about what would be possible in the timescale and budget. There were a few ideas bouncing around my head for months for this project, but I deliberately held off honing in on some until I’d met the group of artists, the team at the library and seen the 5th size books themselves. It was important that whatever I did, those were the key elements that would shape the the project. The next step was to arrange a look around the library building to get a better idea of the scope of the building itself. Back at the end of July I did my first full site visit, looking around the building. Looking at the public spaces as well as the ‘behind the scenes’ areas. I wanted to get a feel for both the volumes within those spaces, but also to understand how the building functioned. To get a sense of narrative to hold a piece together. The site visit also touched on a few of the practicalities of installing temporary works within the various spaces. 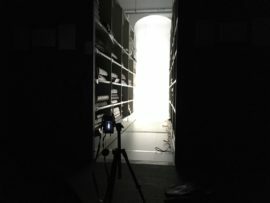 At this point it was decided that the installations themselves would be very temporary and in position only at night after the library closed. Almost a secret existence so the only clue as to their ever existing was through the photographs. With photography being a capture of light over a defined moment in time. At the back of my mind at this point were the dolls of Hans Bellmer. I remember seeing those images in an exhibition of photography and surrealism as a student in London. I remembered the lifeless, pale forms within domestic locations and how just their presence transformed the overall image into something unsettling. Obviously that’s not how they actually were, it’s just how I remembered them, but that’s where the spark of an idea came from. As I played about with the ideas in my head I was looking at how the inflatable pieces would describe voids and space. I’ve recently been exploring similar ideas in the gardens of a country house in the Scottish Borders. There’s something about large inflatable forms within defined spaces. 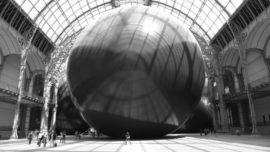 In someways there’s similar elements in Christo’s ‘Big Air Package’ at the Oberhausen Gasometer in 2013 and Anish Kapoor’s ‘Monumenta’ at the Grande Palais in Paris – both of which I’d visited at the time. But it’s also the negative spaces of Rachel Whiteread and the textile architecture of Ho Su Doh – (which I haven’t seen in real life yet). I use these solely as examples or reference points for others. 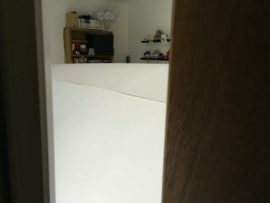 In reality, the idea of filling a space comes from a childhood memory of blowing up a balloon inside a toilet roll tube until it spills out both ends, and growing apples in wooden moulds to get square apples. I don’t really go to see other artists work that much. I find my work is much more inspired by landscape, architecture, engineering problems, photography, stories and people among other things. Occasionally I’ll go and see specific exhibitions or works. I went to see the Christo and Kapoor pieces to experience their scale in much the same way I enjoy the scale of my own work.When I’m busy with projects or immersed in a particularly big piece I deliberately avoid going to see other peoples art. Sometimes I just need to concentrate on my own thoughts and processes and that’s all the art I need. A couple of weeks ago I did a little test piece. I wanted to check that it works the way I was expecting it to, gauge the scale and brightness of the light. I also wanted to check all the logistics and site technicalities – are the plug sockets nearby? will they handle the power consumption? how easy is it to navigate the building out of hours? So I built a little 3m high cylinder from some leftover pieces I had kicking around the studio. I used a small extractor fan from a builders merchants to inflate it as my bigger fans are a bit noisy for indoor use. There’s something about libraries that make you want to be quiet all the time – even out of hours. The light was from a single LED security light. As a test I think it worked very well. The light was just enough for the space and the quality of the light was pretty close to what I was after. There’s a few changes I’ll make to the set-up. I’ll probably need more light inside the shapes if the space is much bigger. I need to put some more access openings in the inflatable so I can get to the lights from the front of the piece, as when it’s inflated to fill a space there’s no way round the back to turn the lights on or off. I’ll also use some additional lights around the space to help with the context of the location and make it a more interesting image. Professional development is a constant process when you’re an artist. I’m sure most artists work is as much practice as practise – in that constant drive to push your boundaries and strive for the intangible thing that constantly motivates you. On top of that there’s the more mundane but equally pressing struggle to make a living out of this journey. I’ve been making a living out of my work for over 20 years now – and I know I’m one of the lucky ones who does this without a second income from teaching or running workshops or farm labouring (all equally valid by the way) – but I’m always looking to find ways to broaden my markets and find way into new territories. As an artist I have a track record of realising projects outside the public arts funding system and I was asked to be part of the team of creative professional practitioners mentoring on this project. Mentoring is great thing to do. It’s a process that I enjoy – getting to know artists from very different practices, understanding where they are up to, where they want to get to, identifying the sticking points and seeing how together we can find ways to overcome them. It’s a very collaborative process and one that on one level I find really interesting. However, the process is often designed to be a very one way transfer of knowledge and support. With this programme I was also interested in how I could use this for my own professional development too, as well as supporting the artists and exploring new ideas with the Library Service. Was there a way this could be mutually beneficial for all of us at the same time? At the heart of the programme is the collection of ‘Fifth-size’ books held at Newcastle City Library. ‘Fifth-sized’ books are very large format editions – technically books between 54 and 63cm along the longest edge. Most of these books are illustration-heavy – maps, books on architecture, sculpture and print and many on the prints of artists, but also includes Bibles, volumes of newspapers, illustrated poems and theatrical scripts. 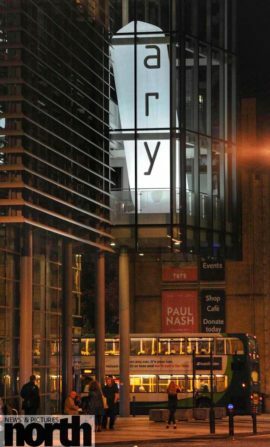 Newcastle City Library is a relatively new building – the current library opened in 2009 and replaced a vast, but dark and inaccessible Basil Spence designed building on the same plot. 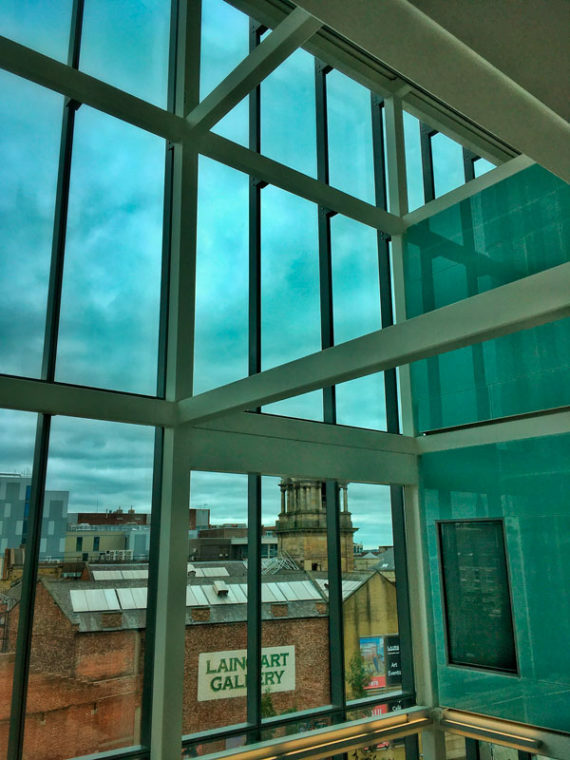 When libraries up and down the country are facing cuts and closures, Newcastle City Library was conceived as a library of the 21st century and built to anticipate change – both technologically and culturally too. Libraries are no longer the sole preserve of books – they are places to find information, learn, talk to people, access services, enjoy film and music… the list continues. In short, they are a place for people. There are many artists who teach or run workshops as a way to share knowledge and inspire others. There is an unwritten expectation that this is something artist just do. . Every publicly funded art programme seems to have an obligatory workshop element in it. Engagement. Engagement is good. There are many artists who are really good at teaching or running practical workshops with people at all levels. I’m not one of them. There really is no point in doing something badly, so I just don’t do them now. For the Fifth Size Book Adventure I needed to find another way – out of necessity. The solution is this. A live project inspired by the Fifth Size books and the library that the artist participants can engage with if they want. 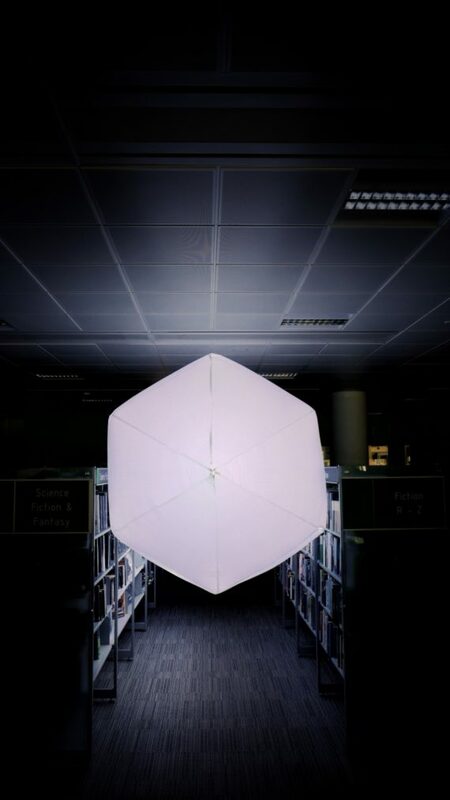 This will entail creating a body of images of very temporary installations around the library building that look at the scale and function of the building – inspired by the scale and function of the 5th size book collection. The final images, along with preparatory images, sketches and text will form a limited edition 5th sized book. The entire project will be documented, blogged and the logistical process shared with the participants of the programme and the library folk. The aim of the project is to explore the potential of the library’s resources – services, collections, knowledge, architecture etc. and find new ways to engage with them for future development. It’s also allowing me to create work in a slightly different manner where the final work is of a more commercial nature. So, I shall be blogging the process – logistics and strategies – throughout. It’s much more for an artist audience so I’ll be posting them here. It’ll be a warts and all documentation about how it all works, with maybe a bit about the creative process too. I’ll also share method statements, outline proposals etc. where I can. On a more practical level, I’ll be shifting my studio to the library for a week at the end of September which will be open to the public so anyone can pop in and see how the installations are made. Most of the photography will be done after hours that week, so you’ll be able to see how the final images are progressing over the course of the week too. So, here’s where this adventure starts for me. OK, so I’ve actually been working on it for a few weeks now and we’ve already done a first site visit, discussed initial logistics and I’ve started making contacts for the book production and sales. I’ll write about that in future posts. But right now the next step is to do some initial visual ideas and do a test shoot later this week to iron out some of the practical and technical aspects. Obviously this is an open blog, so whether you are a participant on the project or stumbling across this blog randomly, please feel free to use the comments below to discuss any part of this idea.